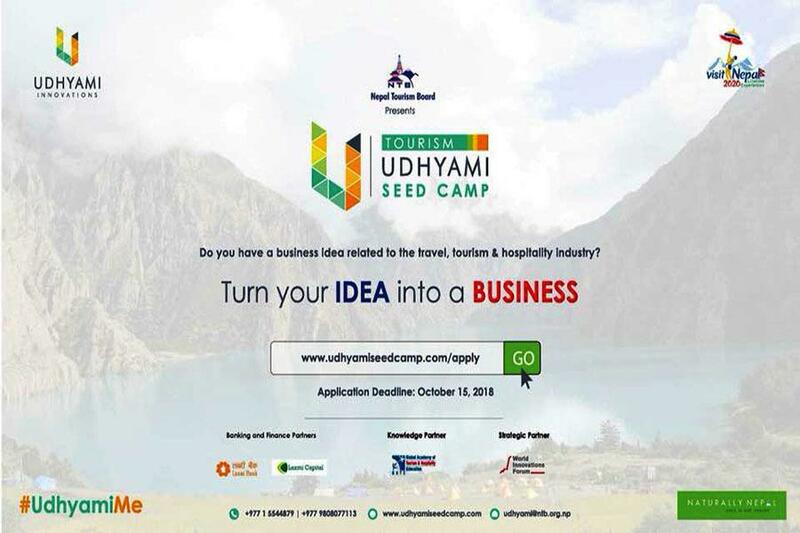 KATHMANDU, Oct 09: In order to welcome the ideas of tourism entrepreneurs all over the country, Nepal Tourism Board (NTB) has announced ‘Tourism Udyami Seed camp’ in partnership with Udhyami Innovations, an organization working on start-up ecosystem in Nepal. The project has been defined as a platform for entrepreneurs to innovate and start new ventures in the travel, tourism and hospitality sector in collaboration. The initiation is expected to offer a platform for innovative ideas to contribute in tourism development of the country, a statement issued by the NTB said. Applications will be called from all over Nepal. The final 20 teams will be selected on the basis of the criteria prescribed along with the viability of the idea proposed, the organizers said in the statement. The participating teams of 2-4 members in each team joined will be provided with full-fledged mentorship and guidance from the entrepreneurs and experts, access their network to the entrepreneurial community, help them in developing the business model, and refine and validate their business ideas with the objective of transforming their idea into the business. Following the camp, the final 20 teams will make an intense research, work on their business model for a month and again make an investment pitch ‘Demo Day’ in Kathmandu. The 20 finalists will be selected for their innovative ideas mainly based on Community Development, The future of Travel, Digital Transformation and the Tourism experience.